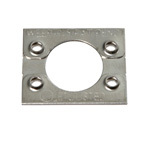 This all-stainless steel grounding lug is like a split bolt with a mounting stud, and can be used on most modules and mounting rails. 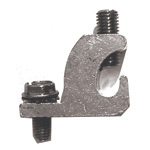 The mounting stud is #8 and comes with a star washer captive on the nut. It takes #6 or #8 solid copper ground wire. 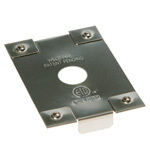 Use this grounding lug where corrosion is a consideration. Listed to UL 467. These UL Listed tin-plated copper lugs have stainless steel set screws and come with either stainless steel thread forming screws and lock washers, or a longer thread cutting stainless steel screw with stainless steel star-washer captive on the nut. Consult the module manufacturer's installation guide to see which type(s) meet NEC requirements for connecting a continuous ground wire to that module. Sold in packages of 10. Washer, electrical equipment bonding WEEB products are used to bond solar modules to aluminum solar mounting rails. 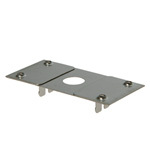 This replaces the lay-in lug and ground wire to each module since the mounting rails can be wired to an equipment grounding terminal in the inverter or disconnect, grounding the entire assembly. 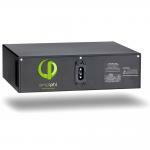 This meets the requirements of UL 467 while streamlining the installation process. 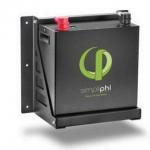 ETL listed to UL standards. 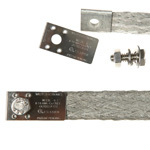 WEEB - PMC grounding clips are used between modules and SnapNrack or ProSolar rails when front mount clamps are used to hold the module to the rails. One clip grounds the frame of two adjoining modules to one of the mounting rails. Two clips are required for each pair of modules so that the modules will be bonded to both rails. Sold in packs of 10. 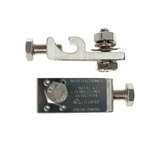 The WEEB Bonding Jumper is used to electrically bond mounting rails together at a splice. Use one at each splice. We advise speaking to your building inspector before installing these products to see if they are acceptable in your area.